Something about laying workers brings out the wizard in us. We think up convoluted ways to rid ourselves of these miscreant creatures, most of which don’t work. Carry the box to the edge of the apiary, turn in a circle with your eyes closed and a drone in your teeth, shake the bees out of the box, apply the appropriate spell, swallow the drone, then beat the workers back to the hive armed with newspaper and a double screen board. Nothing to it. I’ve seen long lists of not-so-successful ways of dealing with laying workers, and I always wonder why we bother to memorialize our failures for future beekeepers. All the methods for dealing with laying workers will fail unless you first correct the problem—and the problem is a lack of open brood pheromone in the hive. Many misconceptions surround laying workers, but if you understand how they come about, you won’t be confused about what you have, how they got there, or how to get rid of them. The thing you hear most often is, “I think I have a laying worker.” The misconception here is that a laying worker is much like a queen, and like a queen, there is just one. But when you think about how they come about, that doesn’t make any sense. Picture this: Your colony has lost its queen. Like the old lady who lived in a shoe, she had so many children, she didn’t know what to do. So she stroked and died. Phew! Now, in this particular hive the workers tried to raise a new queen, but they failed. So after about ten days—give or take—the last eggs your queen laid have become capped pupae. 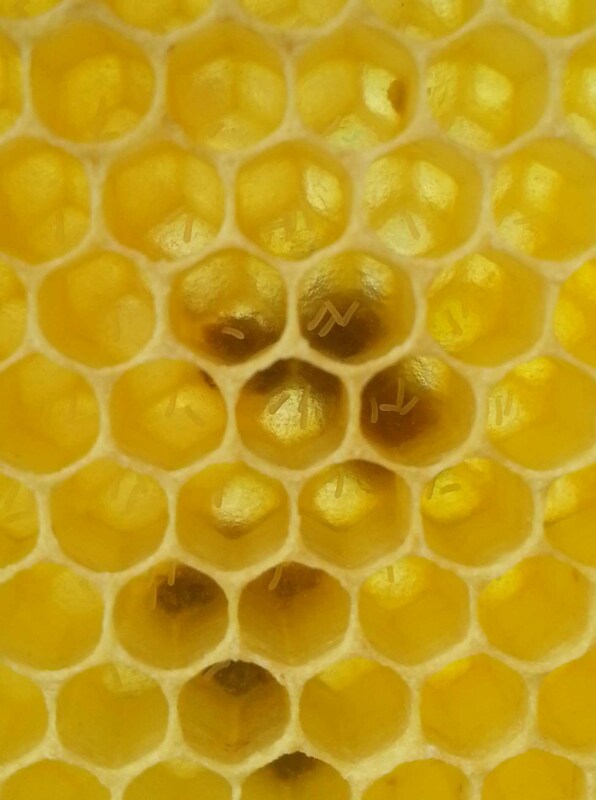 There is no open brood left in the hive. Why so many laying workers? It turns out that open worker brood pheromone is the stuff that suppresses the worker bees’ ovaries. Queen pheromone may play a part as well, but it’s the open brood pheromone that is the primary chemical suppressant. Without a source of these chemicals in the hive, the workers’ ovaries begin to mature. It doesn’t happen overnight, but gradually the workers begin to lay eggs. The exact time varies, but you may begin to see worker eggs about three weeks after the loss of your queen. Think about it. You have thousands of worker bees in your hive and, all at the same time, they lose the open brood pheromone. That means that many, many workers may have maturing ovaries, and they are maturing simultaneously. They all won’t develop into layers; for whatever reason, only some do. But it’s not just one, it is many—perhaps dozens, perhaps hundreds. Soon these workers are laying eggs all over the place. They place multiple eggs in cells or on top of stored pollen. They put eggs in cells with developing larvae. And they drop eggs on comb rims or even woodenware. The pattern is one of randomness. And because worker bees have no way to mate, all of the eggs are haploid (having a single set of chromosomes) and all will develop into drones. The real kicker is that while your hive may suddenly develop lots of open drone brood, open drone brood does not produce the pheromone that suppresses the laying workers. Only open worker brood does the trick. However, the laying workers produce enough queen-like pheromone that the colony will not accept a new queen, so introduced queens are usually killed. No matter what incantation you whisper over the hive, or how surreptitiously you introduce a new queen, most of the time it won’t work. Dumping the bees at the edge of the apiary (to rid yourself of not-so-agile laying workers) and introducing a new queen to the returning bees does not work either because you haven’t cured the problem—the colony is still without open worker brood. The workers will kill the new queen before she can produce any brood, and more of the workers will begin to lay and take the place of those you tossed out. The only way to save the colony is to suppress the laying workers’ ovaries. This can be done by adding open worker brood to the hive. But just as it took a while to develop the workers’ ovaries, it will take a while to suppress them. If you add a queen too soon after adding the open brood, the workers will kill her too. One of the best ways to save the hive is to introduce a frame of open worker brood every few days until the bees begin to raise a supersedure queen. How often you have to add brood depends on how old the brood is. Eggs remain eggs for three days and larvae are open for about 5.5 to 6 days. Since the pheromone is produced by larvae and not eggs, a new frame of open brood should be introduced at least once every five or six days if the larvae are very young, but more frequently if the larvae are old. Once the colony begins to raise a queen on its own, you can either let the bees raise it or you can introduce a queen. The building of supersedure cells indicates their willingness to accept a new queen, so it is fairly safe to introduce a queen at that time. Using the same reasoning, you can combine the laying worker hive with a nuc that contains a queen and open brood. The nuc should be separated by a double screen or similar device to keep the queen safe until the workers’ ovaries are fully suppressed. Allow about three weeks before combining. Other than suppressing the workers’ ovaries, the only other thing you can do is dismantle the hive and shake the bees out in the vicinity of your other hives. (Only after throwing salt over your left shoulder, of course). If the colony has been queenless for a long time, it may be small, aggressive, and hardly worth your time. In that case, you can just shake your equipment free of bees. Some will find a home in one of the other hives and some will die. But in any case you will be rid of the laying worker problem until the next time it happens. Eggs of laying workers. To fix a laying worker hive you have to suppress worker ovaries. Photo courtesy of BeeBase Crown copyright. Excellent post. The “shake them out” misinformation is across languages and continents. A virgin queen raised by the laying works seems to be the only queen they’ll readily accept each time. But even if they do not start a queen cell, at least you get to use their care-taking abilities with the young larvae before they expire. How good they’ll feed youngsters is hard to say. By the way, some people might not be aware, but there are usually several laying workers in huge colonies. Their eggs are consumed by workers who recognize that they were not laid by their queen. That’s fascinating. I’ve wondered, but no one ever seems fit to mention whether the laying workers actually successfully raise drones. Do they? If so, it strikes me as an elegant adaptation. You have a hive that can produce no queen, so there is no mother for the next generation – but it nevertheless can produce a father for a new generation. It’s like a last ditch effort to continue the genetic line. Each of you hit on a point that I deleted from my final draft (in an effort to cater to short attention spans). But Andy, you hit it right on. The honey bees do successfully raise the drones that then pass on their genetics to the next generation. In bumble bees it is even more complicated. According to Dave Goulson in “A Sting in the Tale,” when the queen begins raising sons in the fall (to mate with new queens) the workers sense the presence of the drones and begin laying their own. Fights ensue where the queen eats the worker eggs and the workers eat the queen’s eggs, each competing to pass on their own genetics. Apparently, the fights can be quite nasty. The workers are only 25% related to their brothers (the queen’s drones) but they are 50% related to their sons. So from a genetic point of view, it is advantageous to raise their own sons. Aram is correct, too, that some laying workers are not suppressed in a normal and thriving honey bee colony. Researches who have dissected thousands of workers found that roughly 1% of the workers in a hive lay eggs. Most eggs are eaten, but some make it. Sometimes you’ll see a frame where all the worker brood is together and all the drone brood is together except for 2 or 3 drones cells that are in the “wrong” place. It almost looks like the queen forgot what she was doing, but most likely these are the offspring of laying workers. But Rusty, where do you keep getting frames of worker brood???? Without multiple hivesor friends with hivesit is indeed hard to come up with frames of brood. But if you do have another hive, you can always switch out one frame for another. So, for example, after a frame has been sitting in the queenless hive for a week and is nearly all capped, you can switch it with one that has a greater amount of uncapped brood, and put the first one back in the original hive. A most excellent post. Clear, informative, with a little humour. I have to share this and as I use a different blog I am going to hope you won’t mind if I post a link as i don’t think I can reblog from yours. I had laying worker bees (multiple eggs per cell) in hive with a live 3 year old queen. I couldn’t find the queen immediately so as a first year beekeeper with only one other hive (with a virgin queen) I got quite anxious. Two weeks later I found the queen again and didn’t find any more cells with multiple eggs. I can’t explain this nor have I found anyone who could. Anyone here have an hypothesis? It could be that your three-year old queen is failing, although usually a queen that lays multiple eggs is young and just getting started. You say that now you do not see multiple eggs, but are you seeing any eggs? Is brood being produced? If she is not producing a reliable brood pattern, perhaps you should replace her. Has anyone else seen this? Great photo. Worker-laid eggs aren’t always stuck to the side. In the photo with my post, there are none on the sides. I think your queen was failing, she no longer produced brood, then laying workers took over. After that, the colony died over the winter. Just a guess. The eggs in the photo in the post look like they were laid on top of pollen. The colony was the result of a late swarm, mid July, and was just not big enough to survive the winter. It was my first season of beekeeping, I was just not experienced enough to correctly asses the size of the colony. Another thing that will work sometimes is to take frames of brood with developing queen cells on them and put them in the laying worker hive. I have made a hive raise queens cells by removing the queen for a few days and then place those frames with Q cells into problem hive. Can you recommend further reading about the pheromones that suppress ovaries? Yes. Here are three that I found useful. Also, if you go the site of Dr. Zachary Huang at Michigan State University, he is a wealth of information on honey bee pheromones of all types. “E-β-Ocimene, a Volatile Brood Pheromone Involved in Social Regulation in the Honey Bee Colony (Apis mellifera)” by Alban Maisonnasse, Jean-Christophe Lenoir, Dominique Beslay, Didier Crauser, and Yves Le Conte. “Four Quantitative Trait Loci That Influence Worker Sterility in the Honeybee (Apis mellifera)” by Peter R. Oxley, Graham J. Thompson , and Benjamin P. Oldroyd. “Factors affecting ovary activation in honey bee workers: a meta-analysis” by Backx A, Guzman-Novoa E, Thompson GJ. So workers don’t ever mate with drones and start laying fertile eggs? With a reproductive society so complicated and heavily dependent upon a single fertile female, it seems sensible that in a queenless hive, if some egg-laying workers actually mate with the new drones, they might be able to lay a few female eggs and restart the hive. Or is there something that interferes with this — workers lack the right perfume, mating only happens outside a hive and laying workers never leave to mate, or some such. How long can a queenless hive survive assuming no human intervention? I spent a while looking up the reason, but all I could find in my references is that workers cannot mate. I’m assuming they don’t have the right hardware, but I don’t know for sure. But with nothing but drones being produced, a colony will survive only as long as the remaining workersperhaps six or eight weeks at most. The colony just dwindles to nothing, and the process is often accelerated by robber bees or wasps. One interesting thing, however, is that the cape honey bee worker, Apis mellifera capensis, can sometimes produce females by a type of parthenogenesis. Apparently, these offspring are capable of becoming queens. Who knew? I find this blog fascinating. Thank you. Glen, workers do not lay fertile eggs. They lay infertile eggs which end up developing into drones. Do not know why they would not want to mate with drones, but maybe drones are not attracted to worker bees which do not produce an abundance of whichever queen pheromone seduces them in the first place. Drone have to be discriminate, there are thousands of bees that fly out of a hive. Andrew, your three-year-old queen is probably no longer the three year old queen, but instead a young replacement queen that was learning the ropes. She laid incorrectly at first and then fixed her ways. Young queens often lay 2 eggs in a cell especially if they run out of space to lay but have plenty of eggs that they want to lay. So it is either that, or you had a combination of factors like laying workers and a new queen. The old laying workers died and only the new queen is left. Was your queen marked, do you know for sure you have a 3 yr old queen still? What a very light hearted and informative read on a very serious subject. Thank you. I have a swarm that ended up queenless and now seems to have laying workers. I do not have the resources in my other hives to take frames of brood from, so I thought I would try using the Snelgrove board to re-queen. If I put the Snelgrove board between the brood box and an empty box, with the top entrance opened to the back, would you leave the laying workers and nurse bees on the hive after I put a new queen in a queen cage in the bottom box? Would that suppress the laying workers? Would you remove the top box with the laying workers completely and shake them out? If you try to requeen this laying worker hive, you will likely just lose the new queen. As stated in the post, it is not the queen pheromone that will suppress the laying worker ovaries, it is open-brood pheromone that is needed. Since you can’t afford to take open brood from your other hives, I would either combine this hive with another using a double-screen board (as explained in the post) or just shake them out. I have trapped out a bee tree. I was surprised at the number of drones that came out. I had put a box onto the tree next to where they were coming out. Now after a week the bees have taken up in the box with very few bees coming out of the old hive but the bees seem to have taken to the box. I am wondering if I should introduce a queen? If I do will she be accepted? I feel I need to do something as soon as I can. Please let me know what you think could it be the queen in the old hive has been lost and that is the reasons for the many drones? The number of drones in a natural hive is very large, especially in the spring. I would expect to see a vast number from a trap-out in the spring. Very rarely will the queen be caught in a trap-out, so I would think you need to add one. Check for eggs first, just to make sure there is no queen in there and then add a queen. Use a standard introduction method such as keeping her in a screened cage for a few days before releasing her. Don’t just drop her in or she will be killed. I am new this season to beekeeping. In 1 of my 5 colonies I have laying workers and a bumper crop of drones capped. It’s Sept 1st in central Ontario and I have been told that this colony should be dismantled. So…I can shake the bees off and some may join other hives (only 1 other in this location) others may die. I can use the honey in a hive that needs additional stores but how do I handle the frames that have the drone brood plus some honey and some pollen? I would hate to loose all that lovely comb that they worked so hard to draw out. After you shake out the workers, put a box with the combs of drone brood, honey, and pollen on one of your other hives. The bees will clean out the drones and most likely move the honey to another location. When the frames are clean, you can remove the box. Thank you so much Rusty. I am glad the bees are able to take on that task. It’s mid-March, and my first early spring check shows laying workers in one colony. The other 2 colonies do not have enough eggs/brood to steal frames from. So I plan to shake out the colony, and hope some of the bees will be accepted to boost the populations of the other 2. The theory that I’ve heard is that laying workers do not fly well, so shaking them out at some distance from the hive decreases the likelihood of making it back. However, I don’t know how important (or true) that really is. It seems to me that an established colony will probably not allow a laying worker to enter due to her pheromones, and even if one got in, the real queen’s pheromones would soon suppress her laying ability. I’m guessing on this, but I think you would fine to shake them out onto the ground in front of a strong hive. I wonder if a Tarnarov shakeout would help square-up a laying worker hive. Perhaps the drone layers would beard, not being able to fly over the 4 inch gap. The usual problem with laying workers, but hoping that a new queen has been produced as there are early signs of brood. One can only hope in this game! If you’ve had signs of laying workers and now see signs of brood, it may be that the bees are raising drones. If they’ve had enough time to develop their ovaries for laying, they would not have been able to raise a queen because there would be no fertilized eggs to raise her from, unless you added open brood at some point. In February/March, I checked my hive. I found lots of bees, did not find the queen and the hive had very little capped brood. The frames were loaded with nectar and capped honey. Over the next five weeks, I checked the hive and never found a queen, no eggs and no capped brood. Three weeks ago, I purchased a new queen and slowly introduced her to the hive. I check the hive yesterday and did not find a queen and nor did I find eggs or capped brood. I have a nuc coming to begin a second hive, however could I take one frame from the nuc, with newly laid eggs and brood and place this into the queenless hive in hope the bees with make a queen cell? Prior to this should I dump the existing bees 20 yards from the hive and have them find their way back. Any other suggestions would be helpful. It certainly sounds like the old hive had laying workers, and that those laying workers would not accept a new queen. You can try moving a frame of brood to that hive and the open-brood pheromone will probably suppress the worker ovaries over time. Still, you have to ask yourself if the number of bees remaining is really worth saving. Also, are there enough bees in there to raise the brood? If not, you are weakening your nuc for no benefit. To make this work, you often have to add a frame of open brood once a week for two or three weeks before they start raising a queen. I think I would shake the bees on the ground in front of the second hive and walk away from it. Later in the season, if you still want two hives, you can make a split. I have a worker laying hive chock full of drones. The hive swarmed March 29. I notice the post where someone put in two frames of open brood. My other hive is 9 frame with one deep and several medium supers with brood. How many frames should I transfer? Need to do this quickly. It depends on how much open brood is on the frame. And it also depends how many bees are available to care for that brood. If there are not a lot of bees in the laying worker hive, I would include enough nurse bees to cover the frames. Then, in a week or so, you may have to add another until they start raising a queen. Rusty, I have a hive with a laying worker that I have placed a frame of open worker brood in and also a new queen in a cage. I thought after 5 or 6 days, I would add another frame of open brood. How long can I leave the new queen in the cage? Complex question. First of all, you don’t get a laying worker, you get dozens. Once there is no queen and no open-brood pheromone, many workers will have ovaries that start to develop. You can probably keep her caged for a week, but too long isn’t good. I would not release her if eggs are still being laid, so I would look for that. Also, when you do release, watch carefully to see how the bees react to her. If they start balling around her, remove her immediately. Found laying workers in hive. Can we put this hive on a queen right hive, not only boost hive, but correct it as well? You can try, but I would be very careful. Use a double-screened board or at the very least a newspaper to combine them. You need plenty of time for the worker ovaries to become suppressed, and there may be quite a few of them. It might be better to add a frame of open brood to the laying worker hive for a few days before you start the combination. Would a newly emerged queen lay a double egg in a cell, and maybe on top of pollen? I’m wondering if a new queen could take a few days to get the hang of laying eggs. All the eggs are bottom center on the cell, good coverage pattern, but more than a few cells have a double egg. Then there are a few pollen cells with an egg on top. Absolutely. It is common for new queens to lay double eggs or eggs in the wrong place during the first week or so. The workers will clean up the mess and the queen will mature quickly. Just let them go. They only live four to six weeks anyway and they are causing nothing but trouble. Noted the reference material on pheromones and will read. Caught the start of a laying worker situation and placed hive over Snelgrove board. Do you have anecdotal evidence or actual science this works? It’s an experiment for me; will know in 3 weeks or so. Thought I’d give the girls a chance rather than do the dump. It works as long as there is plenty of open brood in the queen-right hive. I like to check the laying worker hive for eggs before removing the Snelgrove board, just to be on the safe side. You should see very few eggs in the laying workers hive and you should see almost no developing drones. The presence of either eggs or drone larva is a sign that some laying workers still remain. The Hive and the Honey Bee (2015) states that the pheromone responsible for worker ovary suppression is E-β-ocimene. It is highly volatile, so it travels freely throughout the hive. Success. I placed the laying worker deep over a two deep hive and Snelgrove board. I also added two frames of brood to the laying worker box. Two weeks later, no laying workers. Did a newspaper combine with the bottom hive and reduced to just the two bottom deeps and a medium over an excluder. The hive is a going concern today. Thanks for a great tip (shared with my local forum). Great Rebekah! I’m glad to hear it worked. Yesterday I inspected a hive that appears to have a viable queen (her second year) as there is a nice laying pattern and plenty of larva and capped brood in the hive. But, on a couple of frames in the box above the queen excluder I have drone cells – laying workers I assume. I didn’t look for the queen – so perhaps she is failing/dead and I happened to inspect before signs of a problem were evident? I can’t tell if there are any cells from laying workers below the queen excluder. Anything I may be missing? Huge thanks. Hmm. I don’t recall ever hearing this before. It seems that if you have open larvae in the brood nest, the open-brood pheromone should keep the laying workers suppressed. In any case, if you still have brood you shouldn’t have laying workers yet, even if the queen is dead. I do recall reading that every hive has some laying workers at any given time, but they don’t persist and they don’t increase in number. I suppose the logical thing would be to try to estimate the number of laying workers you have. I would see how many cells, if any, have multiple eggs in that upper box. And I would count the number of drone cells and see if it increases or decreases over the next couple of weeks. Also, look for your queen (or eggs or very young larvae) just to make sure she is there. Wow, Julee. That’s a weird one. I believe the mystery of the laying workers is solved. It appears that the queen has been able to pass through the queen excluder. I have two supers above the queen excluder – when I saw the drone cells in the top super I didn’t inspect the second super – just went to the brood boxes below the excluder to see if the queen had died or was failing. Today, following your advice, I went in to count the drone cells and look for multiple eggs. I couldn’t find multiple eggs. The second super had capped brood – no drone cells. The queen excluder is definitely in place. As soon as I began reading this, I thought “Why didn’t I think of that?” It’s a known fact that some queens get through excluders, and sometimes excluders are irregular with wide spots. In any case, I’m glad you solved the mystery. It had me perplexed. Interesting to read all this. Strange that no one seem to have found a reliable method to deal with the laying-worker-problem. Perhaps because it doesn’t happen often. My neighbour has started beekeeping, and I help him as I have experience from many years. In a nuc, laying workers developed. We washed all brood and eggs from the comb and introduced a mated queen in a cage with 10 attendants, cage kept locked. After five days with the caged queen we introduced queen pheromone. After two more days we released the queen. She was readily accepted and started laying. But the laying workers were not suppressed – they kept laying, and there were queen-eggs and worker eggs in the cells. We washed the combs again to remove whatever drone brood was there. The following days the queen kept laying and so did laying workers, but their eggs were now much smaller – less than half the size of queen-eggs. We let them be for a couple of weeks and examined the brood, now sealed. The workers had not sorted the eggs, but removed the excess number of larvae before sealing the pupae, most of the cells were with drone pupae. So the presence of a laying, fertile queen for 2-3 weeks did NOT inhibit the laying workers within two-three weeks. So much for that! We will now try and shake all the bees from the combs, some 50 yards from the hive, let the bees find their way back to the hive and hope the laying workers will not make it back to the hive along with the bees (the queen now being alone on the combs in the mother-hive). After that, we will introduce some young brood comb for a few days and then replace the sealed brood with new open brood, taking the sealed brood back to the brood donor for emergence, so the laying worker hive only “borrows” the brood combs along with their brood-pheromone for a week or so. I’ll let You know how it goes in a few days. This is Denmark, northern climate, and the bees are half wintered so there is not much time left of the season for this experiment. Love your Blog! I’ve learned so much reading your articles over the past few months! I’m dealing with a laying worker hive that started as a swarm a couple weeks ago. I added a couple of queen cells about 4 days ago from a split I started the same weekend I caught the swarm but as you described they killed both. When adding young worker brood from another hive I assume you need to smoke all the bees off first before transferring? If there are adult bees on the brood comb, it would help to smoke it. If it’s free of adults, it shouldn’t matter. The laying worker colony will not kill the open brood. I have some laying workers. Why didn’t they just raise up a new queen in the first place before it got to the point of laying workers? I have a package coming Friday and planned to eventually combine it with the old hive, before I saw the multiple eggs. Combining will require waiting for the package to develop brood, right? Just a queen-right hive above it won’t fix the problem. Having only one other hive seems to be a lot of switching and swapping open brood comb. I hate to shake out the hive because there are quite a few bees in there. The bees probably did try to raise a new queen, but anything can go wrong. She could have died before she was mature. Two or more virgins could have emerged at the same time and killed each other. A virgin could have died on her mating flight, been eaten by a bird, got lost, caught in a storm. You don’t know what happened but there are many possibilities. Just be careful trying to merge with a laying worker colony. They won’t play nice. I used to try to save those bees, but I’ve seen so many things go wrong that I now just let the colony go. They’re all going to die within a few weeks anyway, so they aren’t worth a lot of effort. As you said, when faced with a problem we often put on our dunce cap and come up with dumb ideas to fix it. Sometimes though we might come up with an idea that could work. Let me try one lol. How about taking a frame of drawn comb and cover both entire sides with #5 hardware cloth (like a push cage) completely enclosing a queen and her attendants inside. Put it and a frame of open and capped brood next to it in the laying worker hive. The queen could start laying on both sides and the open brood frame starts your treatment. Then there would be no need to make multiple trips to add open brood and give the acceptance and suppression time to pass. Later remove the two sided cage releasing her. Or did I put on my dunce cap? Other than that detail, I think your theory might work. But I don’t know how much less work it would be. You would have to monitor the queen frame for honey, pollen, and water. I really don’t know if the the workers in the main hive would deliver supplies to the enclosed bees. They might not, especially at first. And brood-rearing bees need tremendous amount of pollen. You also have the problem with drones. Any drones that emerge inside would just add to food requirements that will be needed inside the cage, and for no real benefit. And you also have the problem of defecation. Since the bees can’t leave, they can’t keep things cleaned up. It might start to smell like a feedlot. Also, once they begin emerging, you have to make room for the adult bees. I spent about 20 minutes just now looking for it, but I can’t find the exact multiplier. But if I recall, it’s about 6. So if a frame of brood yields about 6 frames of adult bees, you’re going to have to release them almost every day to make room for the rest. I’m probably forgetting other issues, but it seems that although it may work in theory, I don’t know if it would be a practical solution. I had a double deep hive swarm in April, Rusty, and saw queen cells and didn’t want to bother the virgin queen, but upon inspection yesterday found tons of drone cells. The cells that I saw appeared to have just one egg at the bottom of it. I had 3 hives which all swarmed even though I reversed the boxes and have slatted racks on them. One of the other hives has some capped worker brood but a few queen cells. Only a few resources to add open brood to the laying worker hive. Do you think I should add one frame of open brood and/or maybe a queen cell frame from the other hive or shake out. Also would I place a empty box in place if I did shake out. Lots of bees in the hive and would hate to lose them. Are you sure the hive containing lots of drones is a laying worker hive? There is no worker brood at all? You’ve seen no multiple eggs in cells? The other possibility is that you have a drone-laying queen. A queen like that is still queen, but she only lays unfertilized eggs. In other words, her reproductive apparatus isn’t working right. If that is the case, you could just re-queen. But if it is actually a laying worker hive, then the introduced queen will be killed. If you have a queen cell and open brood, you could add it. But it’s a tough call. These days, I don’t really believe laying worker hives are worth the effort. You have a lot to lose if it goes bad and little to gain if it goes right. After all, the bees that you’re trying to save only have a life span of 4 to 6 weeks, and most of that is passed already. If you’re really certain it’s a laying worker hive, I would just shake it out. You can use an empty box if you want. If not, most of the bees will drift into other hives. I found the queen today. But I know I saw multiple eggs in a number of cells. Combining should be easy now. This queen is at least two years old. Do they ever lay multiple eggs if they’re failing? I believe it’s possible, but not probable. What is more likely is that the old queen is no longer laying or giving off queen pheromones, so laying workers developed. In that case, the bees wouldn’t recognize the queen as a queen. I’ve been reading through some of the comments here and am getting some great advice, so at this point I feel like I know what NOT to do. I have a hive with laying workers; no question about it (multiple eggs in cells). I gave them a frame of open and capped brood. They started to make an emergency queen cell, but stopped attending to it. I am hopelessly queenless. I have three other hives: two marginal hive from packages this season, and one small but strong from a caught swarm. I’m concerned that combining the laying workers hive will just weaken all the hives. Is there a way to “save” some of the bees in the hive before they start capping drone brood? Thanks so much for your advice!! The longer I mess with laying workers, the less I trust them. Sure, people with a lot of time and a lot of resources (open brood) can and do succeed at saving the bees from time to time. But I don’t think it’s worth the risk. Spring and summer workers live only four to six weeks anyway, so weakening the donor colonies in order to save these bees is questionable. I’ve changed my position, I think, because it is so easy to screw up. Also, some bees build more queen cups than others, and they’re often built even if they are not needed. So the presence of a queen cup, doesn’t mean much. Laying workers have laid multiple eggs in a super. What do we do with them? What do you do with the laying workers or the eggs? Do nothing with the eggs. You can try following some of the advice in the post for the laying workers, although colonies of laying workers are often a lost cause. How long does it take for those eggs to die? The eggs are often tended and grow into drones. Those that aren’t tended may be eaten by other bees. If we took the frames with eggs out of the hive completely, they would die because the would not be tended. How long would it take for them to die outside the hive? I really don’t know. Under ideal hive conditions, eggs hatch in three days. But outside, depending on the temperature and humidity, they would probably dry up sooner than that. Thanks for the prompt replies, Rusty. I have looked on line and can’t find the answer. Excellent blog. Fantastic article on laying worker hive. It totally describes my hive over the past 2 months. Thank you! I have a laying worker hive. So I took your advice and introduced some open brood. This seemed to work at first. As after about a week I noticed they had 4 queen cells built. Then I found some large dead white larvae on the ground in front of the hive. Larvae were fully developed. When I checked the hive. There is no evidence of queen cells ever being there. And I still have only drone cells. I’m wondering if they killed the queen cells. I don’t have enough hives to give them open brood again. If I shake all the bees into a new box move it to a different location and introduce a new queen. Will that have a chance of working? Sorry for the long post. Just very frustrated. In order for open brood to work, you need to keep adding more—another frame every five to seven days—until a new queen is raised and accepted. That is why it is not a great idea; it’s a major drain on your other colonies. Putting open brood in only once or twice won’t do anything except frustrate the beekeeper. If you shake all the bees into a box and move it, you will have a laying worker hive in a new location, and they will most likely kill the introduced queen. Let it go. Laying workers are not worth saving. Thanks for the advice. I am now in the process of combining it with another hive. I came across a colony with a laying worker today. It seemed too small to spend a lot of time with so we just shook out the bees. I’ve tried to research the evolutionary advantage of having a laying worker and I didn’t come up with anything. Do you have a theory? Having a colony full of drones is just a drain on the colony, why do you think that this happens. Exceptional question. Let me start by clarifying something about laying workers that has a bearing on my answer. You never have “a” laying worker. They come by the dozens or hundreds. The reason is simple. Queen pheromone and open brood pheromone suppress worker ovaries and keep them from developing. Once those pheromones disappear from the hive, there is nothing to suppress worker ovaries so many, many workers develop and begin to lay. I honestly can’t remember the number, but I believe it’s along the lines of 10 or 15% of the workers will begin to lay. Obviously a laying worker colony cannot survive, but nature has its ways of assisting in the spread of genetic material so that it stays in the population and doesn’t disappear. All those drones produced by laying workers are perfectly capable of mating with virgins from other colonies and, thus, spreading the genetic material of that doomed colony throughout the population. A honey bee colony has many subfamilies: one subfamily for each mating made by the queen. Workers within any one sub-family are true sisters, having the same mother and father. The rest are half-sisters, having the same mother but different fathers. A normal colony has about 12 to 15 subfamilies. So in a laying worker hive, you will have workers from 12 to 15 different sub-families laying eggs that become viable drones. That’s a lot of genetic material that is being preserved to aid in the survival of the species even though the individual colony will be lost. Wow! What a forward thinking species. Being a human who only thinks of her own survival it had not occurred to me to think beyond my own needs and default back to the needs of my species. I’m sure they’re not thinking these things, but the systems that have evolved to protect a species are remarkable. Honey bee are survivors and it shows. In some native bees, only about half the brood emerges in the spring. The rest don’t emerge for another whole year or even two. This is in case there is a bad year, such as drought or lack of flowers, the species has another chance the following year. Will a laying worker lay eggs in old swarm cells? I have a hive which appears to be queenless – perhaps as a result of a swarm in June and their queen did not make it. I’m sure I have a laying worker because I saw multiple eggs in cells (I was hoping it was just a young inexperienced queen), and after 3 weeks, I see a ton of drone brood. I noticed that there were larva in the swarm cells, one is capped. This threw me for a loop – thinking – how could they have gotten an egg to rear a queen in the queen cups if they have no queen? Thanks in advance! I don’t know if laying workers will lay in queen cups or not, but I don’t see why they wouldn’t. You mention seeing lots of drone brood, but you don’t mention worker brood. If you have worker brood, you may be okay, but if it’s only drones, that’s a bad sign. Thanks for the reply, Rusty! I *think* there’s a tiny bit of worker brood, extremely spotty. Judging by all that’s NOT going on this hive and seeing so much drone brood, I think it’s a goner. Shame, they were doing so well before the swarm. Love your site and all its information! Very thankful for you! I have noticed that I have laying workers and when I put open frames they start working on it but then they destroy it. Then I got a frame with two close ready queens but before they come out and now I am waiting will they kill the new coming queens from the new frame? If you have a lot of laying workers, they will most likely kill the new queens. I had this problem (laying workers) this year and I took the hive (2 large supers) to the edge of the property, removed ALL the bees, brought the sealed hive back to its original location, opened it placed a new queen in a queen container in the hive, waited 4 days, released the queen, and a week later checked for the queen and new eggs and all was well. Honey production was down as this process took about a month. I’m not disputing that impact of the open larva pheromone, I don’t know anything about that. But removing all bees at a location a few hundred feet from where the hive usually is and then requeening worked for me. In not sure if this is true, but I’ve been told that the laying workers are newer bees who’ve never left the hive do when they’re dumped far enough away, they can’t find their way back. Anyway, like I said this worked for me. Perhaps you had a drone layer instead of laying workers. It’s mid October and I just discovered I have a virgin queen with not much likelihood of getting mated. Today I checked the hive and could not find the virgin queen, my concern is that the hive will go into winter with either a virgin queen or no queen at all. What is the chances of the hive surviving and what advice would you give. I have tried to get a mated queen but just not the right time of year. Without a mated queen, the colony won’t make it until spring. It will most likely develop laying workers and then collapse. Just curious, why do you think your queen is a virgin? She is a virgin queen because the queen swarmed and left unmarked queen. Also because there is no brood at all in the hive. Okay, the original queen left, I get that. But just because there is no brood doesn’t mean she’s a virgin. Broodlessness is common in October, November, and December. I’m not saying for sure she’s mated, but she could be. Hi rusty just read your blogs regarding no eggs or brood at this time of year and it was very helpful. The hive swarmed about 3 weeks ago and so not sure she mated in that time. Once the hive has swarmed how long does it take for a new queen to try and mate? If she is still a virgin queen do I just leave the hive and wait for it to collapse? Sorry to ask lots of questions I’m in my first year of beekeeping. Virgins usually emerge a day or two after the swarm leaves. They spend a few days maturing, maybe 3 or 4, and then they begin taking their mating flights, which may take another day or two or, if you have lots of bad weather, up to a week or more. Then another few days of maturing before they are ready to lay. If you have another colony, you could combine it. If not, all you can do is wait and see unless you can get a queen from somewhere. Thanks so much, how will I know if they are laying workers. Thanks really interesting. Will the hive produce laying workers even if the virgin queen is in the hive? Yes, if she’s a virgin, she’s not producing the right pheromones. Hmmm! Yep, lot’s of voodoo out there, usually due to misunderstanding, both of bees and research. And of course what may be accomplished on a bee station where time is of no consequence, is of no use for we humble hobby bee keepers; we need a simple and efficient solution. Replacing combs of brood is okay, but takes time and often fails, It’s never worked for me, and I know that my father has tried too without success. If we could detect the pheromones, t’would be easy. The following method absolutely does work. It works because laying workers tend to have never flown, and so their orientation on the hive will be poor if any, nothing to do with being ‘flight heavy’. This method has never failed for me. It’s QUICK & SIMPLE. You’ll usually fail to re-queen if the culprit is not removed, so why be uncertain? Keep your eyes open! More often than not, the laying worker is a queen (they TEND to lay single eggs but not always) ! Unmated/infertile queens can be fleet of foot and so often missed, even by people like me who have been at it for fifty years. Hives dominated by laying workers are not very common. Sometimes they don’t lay! (same goes for unmated/infertile queens), but since they are producing queen mandible pheromone [QMP] etc. introduction/raising of queens can fail. Shake ALL bees onto the sheet from brood AND supers – I usually empty a box of frames and then replace one frame at a time. NO bees should be carried to the hive. The chances are that you’ll have a small clump of bees left behind, this is due to non-orientation (nowhere to go) and the fact that QMP tends to promote retinue formation, so some bees will be ‘loyal’ to the ‘queen’. It’s also possible that development of the other workers may be suppressed due to not having a full compliment of ‘queen pheromones’ thus they may not become foragers, and so flying/orientation is reduced. to re-queen, In order of availability/needs…. A) combine with another colony after a couple of days using the paper method (punch a few holes with a knitting needle – faulty colony on the top of the paper. B) if you used the original frames, wait at least four days then add a frame with eggs, or better, a queen cell (just one). They should be keen to find new eggs by now to create a queen. E) Wait at least three days, add a laying queen in a butler cage with three or four workers. DO NOT open the tab if the bees are biting the cage, we don’t want her killed. Check each day, then allow the bees to eat the candy plug. If adding a queen cell on it’s own (not on a frame) then remove a frame for space, and place it at the top of the brood box (balance with a cocktail stick). Queen cells are very delicate. handle with care. If you have queen rearing kit, ‘hair rollers’ etc. then use them since she can be protected prior to and after emerging. Affix a butler cage in a similar way. Lots of access all around. When I set up butler cages, I add a wrap of foil, held with electrical tape near the top to add an area of refuge for the queen in case she is being pestered. Don’t cover all the holes or prevent her exit. As I say, this has never failed me when ridding the hive of a laying worker. How to fix a laying worker hive. Just do exactly what I am going to explain and your hive is going to work again successfully. If the hive is weak make it strong with another queenless hive to be strong one. How to gather them? You can spray a rose water on them to forget their own smell. Be sure about the temperature it should be warm weather upper than 23 C°. Then put an open brood frame and let them make a single queen. When the queen born add another open brood frame to fear the workers that there is a queen around. The single queen is going to go out to get married. When the queen comes back the workers generally think that there is a queen and so the queen arriving is going to be safe. Rusty, I am grasping at straws here in hopes of some answer other than the one you already have (human nature to not accept facts). I have a single hive and live very far from town (although I will drive and pick up another nuc if need bee) and it is a dry open place away from my homestead. People do not see honey bees out here. We opened the hive two days ago that was very strong going into winter. There were much fewer bees, capped drone brood and cells with sure signs of workers laying. The bees were quiet and many foragers were bringing in pollen. We assumed they were ledtover frim a swarm. ( Hope to find them here on homestead but worried for them as the wind has been very bad for days) I immediately ordered a queen who has arrived today. I was about to put her cage in the hive when i figured I’d best double check and have now read your article. Can I try and split the hive somehow? Or place frames of honey and open comb into a new hive box I have along with the caged queen, tossing away the drone comb? Please tell this new keeper exactly what she should do! I’ve put the queen cage in a warm place with a drop of honey and water for her attendants to feed her while I await the answer to my mistake! I think I have a conundrum even my ‘go to guy’/bee expert/supplier is vexed by. You see, last week here in S Ontario, the weather finally warmed and I opened the hive to find more bees than I expected, a bit of honey still available, but absolutely no brood anywhere where I expected. No eggs (well actually some in the bottom most bridge comb, many to a cell), larvae, or capped brood. My guy said to give it a week, and see if they are bringing in pollen, for then I must have just missed seeing the queen. Well today is a week, and I checked all 30 frames carefully and individually. There were cells with fresh pollen, many with syrup (with bees busily fanning them) … but no brood still. Nada. My guy is at a loss. He says I could try a fertilized new queen or do nothing and see what happens. From reading your post, am I correct in thinking a new queen will be killed, so I am basically wasting my time, the hive is a dead hive buzzing? Note: this is my only colony until a couple of nucs later in the month. First of all, many people do not realize that too much pollen can signal a queen failure. Usually pollen collection signals that all is well, but not always. Second, if you see strong evidence of laying workers, things won’t get better by themselves. It sounds to me like you have a laying worker hive. You can try requeening, if you want. But once you have multiple layers, you’re going to have serious problems. I must have given you the wrong impression about the pollen. I went back to examine the hive again. I again found not one capped cell, no evidence of worker layers, some pollen cells (<50 cells in 30 frames), no eggs, no larvae, no queen. But lots of cells with sugar syrup in them, and workers busily fanning and moving about. In fact, the bottom medium was almost abandoned, the middle one had the spotty pollen and some syrup and the top medium over half full of syrup. So am I right in thinking without evidence of worker layers, I can successfully introduce a queen and maybe, just maybe save the hive? That’s very strong evidence of laying workers. Both true. First time I looked I saw some (unless I am going insane), next time, same spot, no eggs. Whaaaaat? Being a male, I don’t understand the females of my species … certainly not my (girl) bees now either! As always, your help is most appreciated Rusty. Based on what you have posted I think I’m at the point of dismantling a hive with laying workers. What is the best approach to take with the frames so the other hive (I have two) can use any resources they may want out of the frames? I was planning on taking the hive several yards away shaking it out and then let any flyers get incorporated back into the good hive but not sure where to leave the frames to get cleaned out. I have an idea: Take laying worker colony and funnel all the bees into a package shipping container. Leave them in there with the can of syrup on top. One day later add a queen cage. Leave them all in there for a few days, just like the shippers do. On day 4, put them in a new hive body in a completely different location just like you were installing a new package (which essentially they are now) or like installing a swarm w/o their own queen. If you don’t have a shipping package, use an empty hive box with foundationless frames and a jar of syrup on top. OR on day 4 put them ( the cluster and queen cage) into a new hive body and add a frame of eggs/open brood. Release the queen or let them do it. She will have a frame ready for her. Basically, turn them into a homeless colony/swarm/package for a few days and give them a queen cage. And if you can, a frame of eggs after a handful of days. But this won’t suppress the worker ovaries. They are going to kill that queen. Oh, well, shucks, I thought I had a solution to my laying colony without stealing from other colony’s, which I have been doing without success. Maybe I’ll try the snuggleuhfagainst board or whatever it’s called. Maybe I’ll just let them fill the house with honey. Just a point of curiosity. How long can a colony of laying workers survive? It seems the laying workers would live longer than normal, if they are not leaving the colony to forage. So the foragers continue to bring food, but the colony is increasingly composed of drones, which cannot forage, correct? Do the foragers care for laying workers like they do queens? It also seems that laying worker drones would be smaller than drones produced by a queen. Would such drones really be able to mate with a queen to pass on their genetic material? I don’t know how long laying workers live, but it’s probably longer than a forager. Right, drones do not forage. I don’t know how the other foragers respond to the laying workers. I imagine laying workers probably feed themselves, especially if there are a lot of them. I’m not sure why you think laying worker drones would be smaller than regular drones. Did you read that somewhere? They really are capable of mating and passing on their genetics. I assume that laying workers’ drones would be smaller since they’re laying them in worker comb. Perhaps if there are nurse bees present they are able to expand the cells? At any rate, it would seem that over time there would just be a bunch of smaller drones, either due to comb size or just malnutrition from not having nurse bees to take care of them. Okay, I see what you mean about cell size. Whenever I’ve seen them, the drone cells look very similar to regular drone cells with the bullet-shaped caps. Perhaps the cells get expanded by the workers? Laying worker colonies still have lots of workers to feed and care for the drones. If I recall, the laying workers only reach 10 or 12 percent of the population. Something like that, but I would need to look it up. I read somewhere that the nurse bees select one to raise and eat the rest. Sounds reasonable.